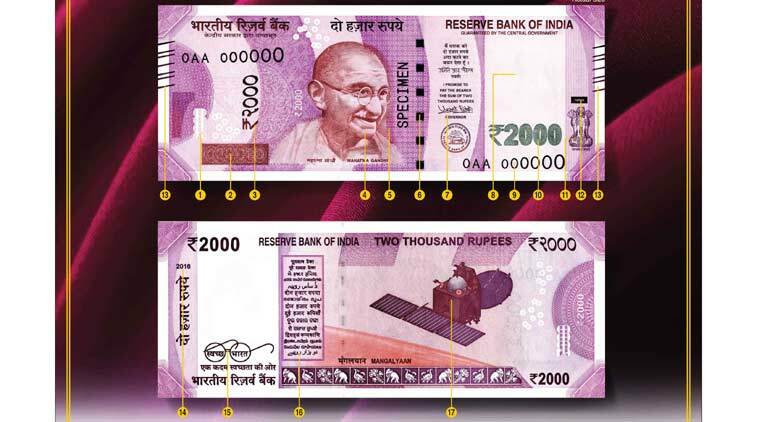 Security features on the new Rs 500 and Rs 2,000 notes. * See through register with denominational numeral can be seen when the note is held against it. * Latent image with denominational numeral can be seen when the banknote is held at 45 degree angle at eye level. * Denominational numeral in Devnagari. 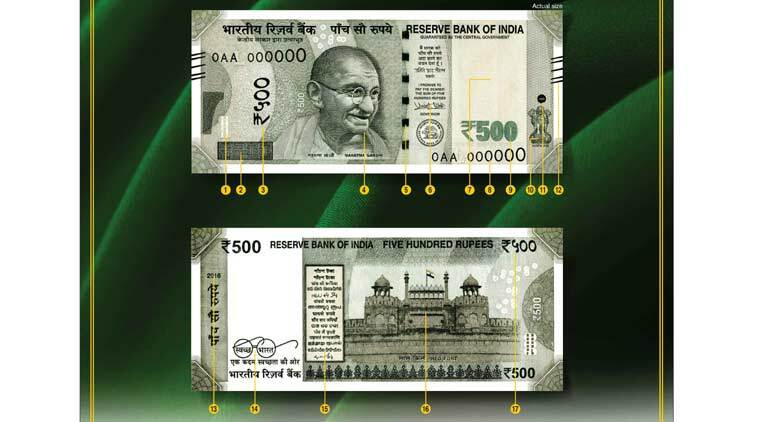 * Colour shift windowed security thread with inscriptions ‘भारत’, RBI and denominational numeral. Colour of the thread changes from green to blue when the note is tilted. * Guarantee clause, Governor’s signature with Promise Clause and RBI emblem towards right. * Mahatma Gandhi portrait and electrotype watermarks. * Number panel with numerals growing from small to big on the top ledt side and bottom right side. * Denominational numeral with Rupee Symbol, in green to blue color changing ink. * Ashoka Pillar emblem on the right. Raised printing of Mahatma Gandhi portrait, Ashoka Pillar embelem. * Portrait of Mahatma Gandhi in the center. * Orientation and relative position of Mahatma Gandhi portrait changed. * Circle with denomination printed on it. * Five bleed lines on left and right in raised print.